IMPORTANT NOTE: This is an old version. If you are considering buying ChordMate, please take a look at ChordMate 3. 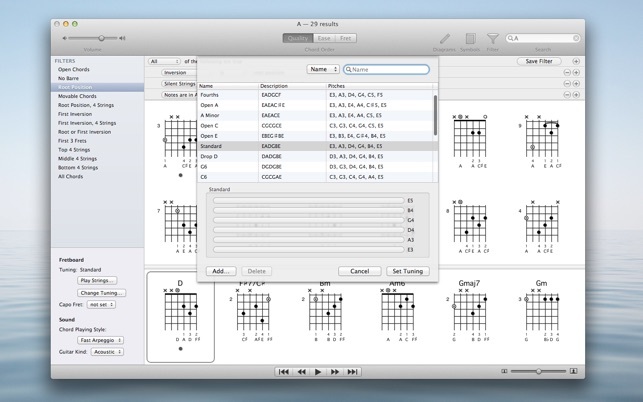 ChordMate 2 is here as an important 2.x update for existing users. 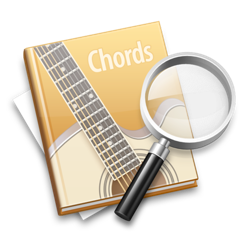 - Choose from the list of chords as you type your search. 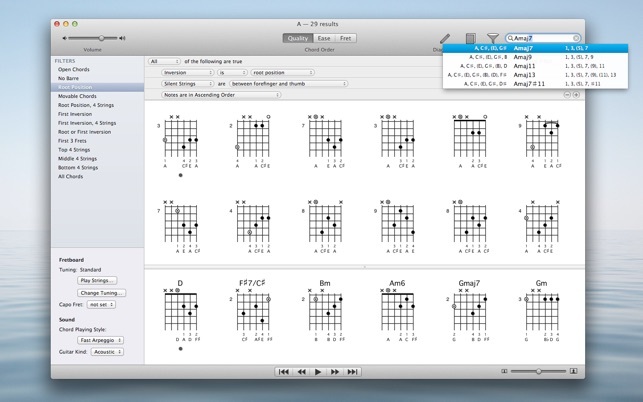 ChordMate shows the list of matching chords, their notes, and formulas. - Set capo and alternate tunings. ChordMate works equally well with any tuning, so you can explore new tunings with confidence that you won't overlook an interesting chord. Drag and drop or copy / paste into Songs, our song sheet editor. 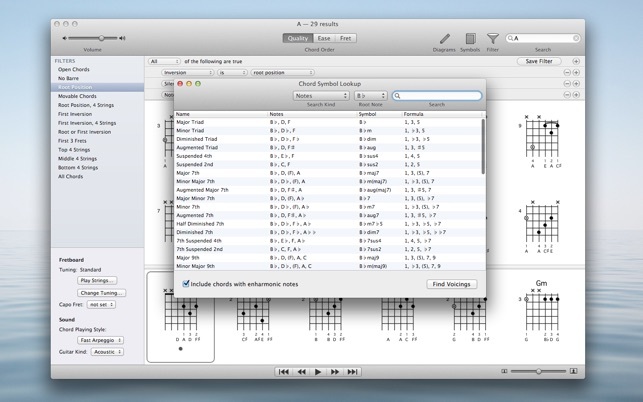 This App is pretty good for putting together chord progressions, however, if you could create midi files from the chords and export them, this program could be great. I like this program. 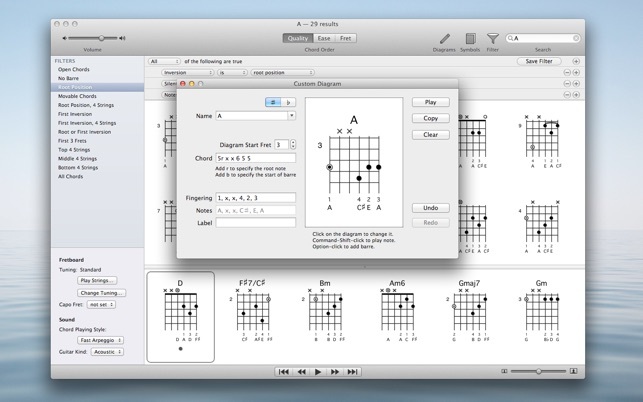 I'm using it to construct my own chord sheets for a class I'm teaching. It's easy to find a chord and drag it into a word processing program. Once in the program, the frets can be easily re-sized, which I truly love. For my purposes, I frequently move a note or 2 in the chord, or add/ delete notes (simple mouse clicks). Sometimes I rename the chord. By clicking on what looks like a crayon in the menu, a blank fret shape appears off to the side, over which you can drag any chord from the library. It is there that you you change the notes, name of the chord, and fingerings. After that, you drag the chord into your library or into your WP program (like Pages), or both. When I had questions, support was immediate and thorough. The only flaw is that you cannot create a library of new chords that you create. For example I would like to be able to set up my own folder for just 3-note chords. Another thing I wish it would do is, once you line up a set of chords, that it would play the progression. All it does is play each chord as you click on it individually. Those 2 things are what prevent me from going all out with 5 stars. I found this program just 3 weeks before my class and have easily made the 8 worksheets I need. I will be making a lot more with this program. Now if I could find one for ukulele that works like this one. Highly useful and highly amazing. Amazing. I was sold on the Mac version over iPad by the fact that it can make sense of custom alternate tunings, which I like to use a lot in songwriting and jamming out in general. I spell open D a bit differently than most, with an E on the high string, for example. Also, chord symbol lookup. I love finding uncommon chords, and incorporating them into my playing vocabulary. Problem is, I rarely know what they are. I already can see, within a day of use, this is a great tool to better understand, document, remember, and communicate what I'm playing. Powerful.